APC by Schneider Electric's Back-UPS 325 provides enough battery backup power so you can work through short length power outages. The Back-UPS series is "greener" than ever, using an ultra-efficient design that consumes less power during normal operation than any other battery backup in its class. This reduces your energy costs and environmental impact. Combined with all of the standard features of the Back-UPS series, the 325 is the perfect unit to protect your productivity from the constant threat of bad power and lost data. • 2 battery backup and surge protection - Keep critical electronic equipment running when the power goes out or fluctuates at dangerous levels, so you can protect your work and save your data. • 2 surge protection only - Protect your secondary electronics from harmful surges and spikes without reducing battery capacity used to run primary electronics during power outages. Guards against damaging surges and spikes traveling over an analog phone line. "Double Boost and Single Trim" AVR instantly corrects voltage fluctuations without using the battery, allowing you to work indefinitely through sustained voltage increases and decreases. Periodic battery self test ensures early detection of a battery that needs to be replaced, ensuring your unit is ready when you need it. and online support, providing customer peace of mind. 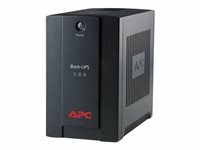 Battery Backup with Surge Protection for Electronics and Computers. APC by Schneider Electric's Back-UPS 700 provides enough battery backup power so you can work through medium length power outages. It also safeguards your equipment against damaging surges and spikes that travel along utility and phone lines. The Back-UPS series is greener than ever, using an ultra-efficient design that consumes less power during normal operation than any other battery backup in its class. This reduces your energy costs and environmental impact. Combined with all of the standard features of the Back-UPS series, the 700 is the perfect unit to protect your productivity from the constant threat of bad power and lost data. "Green mode" energy saving feature automatically powers off peripheral electronics when the master device, usually a PC, hibernates or is shut down. Power to peripherals is immediately restored when the master device wakes up or is switched on. Achieve high operating efficiency and reduce energy consumption without sacrificing any protection. 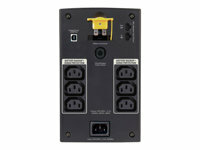 • 4 battery backup and surge protection - Keep critical electronic equipment running when the power goes out or fluctuates at dangerous levels, so you can protect your work and save your data. Provides protection of connected equipment from damaging power surges on telephone and Ethernet data lines. Use your PC to access additional power protection and management features for your Back-UPS 700 via a USB Port. 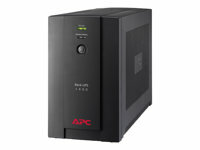 Battery Backup with Surge Protection for Electronics and Computers APC by Schneider Electric’s Back-UPS 550 provides enough battery backup power so you can work through short length power outages. The Back-UPS series is "greener" than ever, using an ultra-efficient design that consumes less power during normal operation than any other battery backup in its class. This reduces your energy costs and environmental impact. Combined with all of the standard features of the Back-UPS series, the 550 is the perfect unit to protect your productivity from the constant threat of bad power and lost data. the master device wakes up or is switched on. Achieve high operating efficiency and reduce energy consumption without sacrificing any protection.